School Education - N.T. 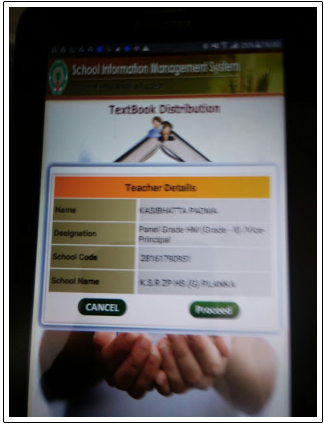 Books for the year 2018-19 - Monitoring of Texts Books Distribution and Acknowledging the Text Books through Books App - Certain instructions issued - Reg. All the Regional Joint Directors of School Education and District Educational Officers in the State are informed that the Distribution of N.T. Books is being monitored by Hon'ble Chief Ministers Office through Core Dash Board. In this connection the following are to be ensured and necessary actions has to be taken in this regard. 1.l. To ensure 100% Distribution of N.T Books to the School points against the availability at District Text Books Depots. To achieve this, coordination is to be ensured with the Transport contractor who was already engaged. If necessary Manda! Educational Officers may be instructed to have their own mode of Transport to lift the Books from District Point to Manda! Point. Additional Transportation Charges if any will be paid by this office under proper justification in claim. 2.To ensure all Text books that are reached to Manda! Point should be supplied to the schools immediately. 3.The Books supplied to School point should be given to the Student immediately. 4.To Acknowledge the Text Books through the Bio-metric Application. 5.Monitor the Acknowledgement process closely so as to reflect the Number of students who received the Books in the Hon"ble Chief Minister's core Dash Board. 6.The Mandal Educational officers should ensure the NT Books Acknowledgment from all the Head Masters through biometric. 7.All District Educational Officers should monitor closely the Acknowledgment submission in biometric application on or before 04-07-2018 by 03.00 p.m.
8.All the RJDs should visit District Text book depots, Mandal Storage Points and Schools randomly in their Jurisdiction to Monitor the N.T.Books Distribution process. 9.Therefore all the Regional Joint Directors of School Education and OisbiCt Educational officers In the state are requested to folk,,v the above Instruction scrupulously and submit compliance.